One of the sweetest subsections of the duck family has to be the sawbills, formally known as mergansers. Mergansers are a family of diving waterfowl in Merginae, the seaduck subfamily of Anatidae. Ironically, only one of these seaducks is truly a seafarer, the others favoring rivers and lakes. The name ‘merganser’ is said to have originated with the German naturalist, Gesner in the mid-16th century. This comes from a combination of the Latin words mergus (diver) and anser (goose). 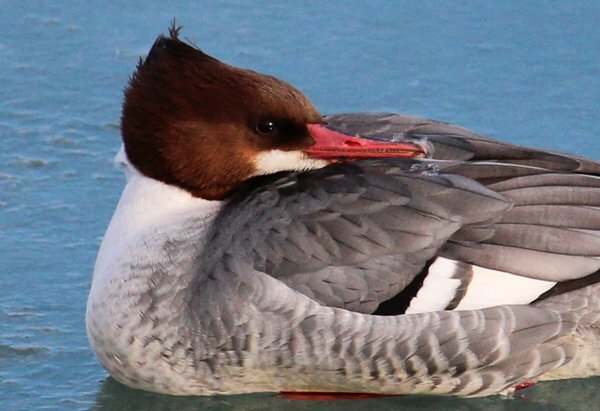 Mergansers are sometimes referred to sawbills because of their long, serrated bills. These narrow bills, hooked at the tip and set with numerous horny denticulations, are adapted for catching fish, a merganser’s primary source of food. Mergansers primarily feed on small or medium-sized fishes which they capture underwater by swift pursuit. These divers also supplement their piscine diet with frogs and aquatic insects. The Common Merganser (Mergus merganser) ranges widely throughout the northern hemisphere. The name “Common Merganser” has always seemed like something of a misnomer since it isn’t particularly common during most of the year (although every winter I find huge flocks outside my office building!) 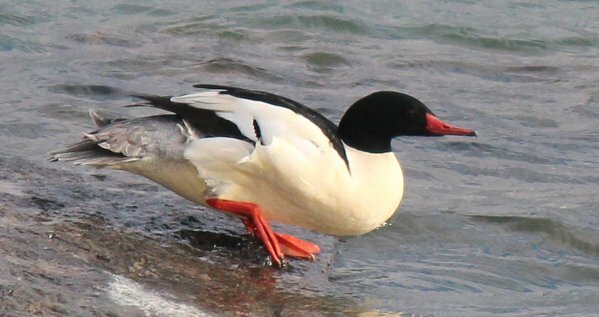 Goosander, which is what this species is called in Europe, may be a more accurate alternative, although Mergus merganser doesn’t really resemble a goose either. The drakes are quite striking, snowy white along its flanks, breast, and tail with head and neck covered in green plumage of such surpassing depth that it appears black. 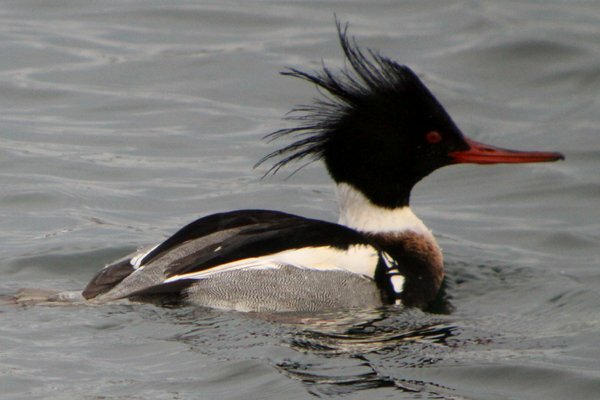 When is a merganser not a merganser? Perhaps when it doesn’t fall in the genus Mergus. However, the Hooded Merganser (Lophodytes cucullatus) is so handsome, the drake flaunting a white, fan-shaped, black-bordered crest, a black body with chestnut flanks, and white breast with vivid vertical black stripes, that any family of fish ducks would be pleased to claim it. Anyway, the hoodie is the only merganser endemic to North America. The Smew (Mergellus albellus) also falls outside the genus Mergus, so far in fact that it has been known to interbreed with Common Goldeneye (Bucephala clangula). This atypical merganser, which favors the coniferous reaches of Eurasia, is the smallest of all sawbills. The Chinese Merganser (Mergus squamatus) is also known as the Scaly-sided Merganser, with good reason; this dashing duck resembles a goosander with a wispy topknot and fish scales along its flanks. While this merganser does maintain a strong presence in China throughout the year, it may breed as far north as Russia and winter as far south as Thailand. It is also a species in rapid decline, considered vulnerable by some authorities and endangered by others. Chinese Mergansers do not exhibit the gregarious nature common in most ducks, usually appearing in solitary pairs or very small flocks. The most threatened of all mergansers is the Brazilian Merganser (Mergus octosetaceus). The sole sawbill of the Southern Hemisphere is down to 200-250 birds extant mainly because the habitat it requires is equally threatened. With hope, this bird will not go the way of its extinct cousin, the Auckland Islands Merganser (Mergus australis). The Brazilian Merganser is rather drab by merganser standards but it does possess truly vibrant vermilion legs. I’ve only ever seen a Common Merganser but I saw one yesterday. Serendipity! Great report on a really cute bird! We had a pair of Mergasers on our pond. The male left while the female was nesting, never to return. The femail pushed the young out of the nest a couple of days ago. They It was wonderful to watch then on the pond. We looked on as the mother tucked tucked them away in the tall grass and flew off. She returned about an hour later. She landed in the middle of the pond and began calling. She swam all along the shore lookinng and calling. almost like she forgot where she put them. I am aware that there are snakes and other animals that would love to get ahold of them, but it is hard to beleive that they all disapeared in an hour. Any ideas? Does the male usually leave and not return? I have a cabin on Apple Canyon Lake in northwest Illinois. While I was on my first fishing outing of the year I saw an entire flock (about 25 birds) of a black and white duck of some kind. Later that day I saw a pair and thought that they were some kind of loon because they were diving for fish. As you know they turned out to be common Mergansers. The birds are gorgeous and I hope that they stay on our lake. I have never seen them here before. Excellent discussion of the Mergansers. You mention that the Smew interbreeds with with Common Goldeneye, but the same is true for the Hooded Merganser, and the experts tell us (see account in Birds of North America) that Lophodytes is a genus intermediate between the Bucephla (Goldeneyes and Bufflehead) and Mergus. 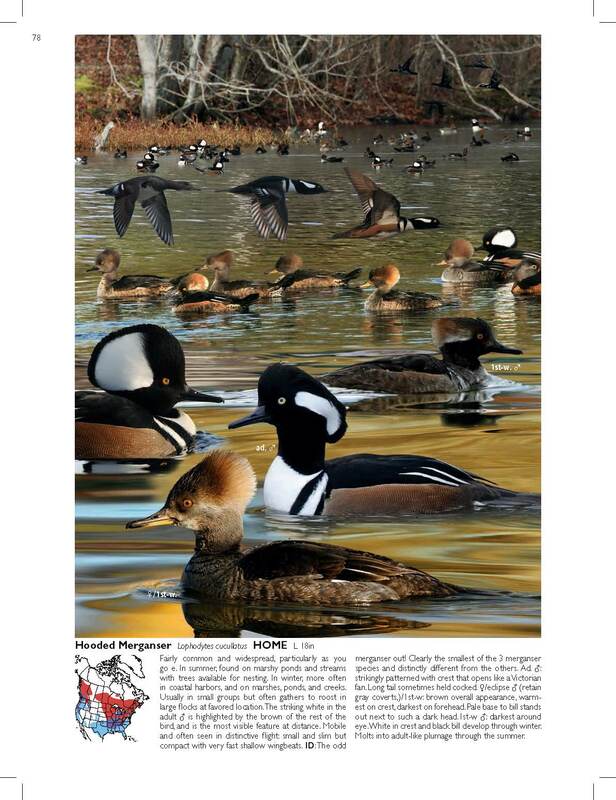 Hybrids between Hooded Merganser and Common Goldeneye are well documented, and folks in the San Francisco Bay Area have been able to view a beautiful duck that the experts think is a hybrid between a Hooded Merganser and Barrow’s Goldeneye (Wester Birds article, by Joe Morlan). Len, thanks for adding more to our understanding of merganser promiscuity! what food does merganser birds eat?? Francesca, your question is answered in the second paragraph. But Len Blumin has summarized the answer: they prefer fish and have serrations on their bills to catch hold of them, but will eat other aquatic life if they catch it, like bugs or crabs or worms. my friend laolin counted Chinese Merganser?there were 86 in a bird census for a NR in jiangxi CHINA 2007. laolin also a bird guide in china?he donot speak english? lin wants to share his photos of birds to the people who love birds?there 3000G?i googleed Chinese Merganser ,and found this website 10000birds, i am a chinese ,whom should i talk to ? many thanks . Mergansers are wonderful ambassadors – one of the first birds I saw the Inimitable Todd get really excited about was a Common Merganser, and during my post-Christmas Central Park walk all my friends really enjoyed the Hooded Mergansers on the reservoir. I love the Mergansers. Yesterday, while tracking down an Audubon’s Warbler, I was treated to all 3 mergansers in the creek at Sunken Meadow park. I am happy when I see all three in one day, but on the same body of water, at the same time, !! Thanks for a great Merganser lesson! I love Mergansers, too, and really appreciate this post. All your photos are of Mergansers above water. Most of my pictures here on the Olympic Peninsula end up showing them with their heads underwater searching for food, or already diving. I took a very funny photo of three Red-breasted Mergansers in a row with heads underwater. Mergansers are such cool ducks- thanks for the informative post. In Costa Rica, we are currently enjoying our first record of a merganser species for the country. In a stellar season for ducks, am amazing Hooded Merganser showed up at a lagoon nestled within Caribbean slope foothill rainforest at the Pocosol reserve. I hope it sticks around long enough for me to go see it! @Wendy, I’d love to see that photo. @Patrick, that’s an amazing incongruity, seeing a duck that doesn’t mind a harsh winter hanging around in Costa Rica. Good luck adding it to your country list! Hi Mike, I don’t think I can attach the photo here. If you email me, I’ll send it to you. Hello, I just swam in Dover port in UK with a large flock of mergansers fishing nearby. On the internet I saw the hooded merganser and it looked so familiar. I used to live in a boat in Massachusetts, and I fell in love with a little black and white bird who would ‘yodel’. Was that the hooded merganser? Recently saw about 15 red-breasted mergansers on a lake here in York Pa. This is the most I’ve ever seen here. They would all dive and reappear in unison. The common mergs nearby all seem to dive individually. I was wondering if this is common behavior for the red-breasted? @Chuck: That is a pretty common behavior for them. It’s almost as if they are synchronized swimmers! living on the largest lake in California (clearlake) I have seen many birds, herons, grebes, mallards, and etc. but I must say the common merganser is the most gorgeous birds I seen yet.! We also have been blessed to have pelicans on this lake also. Nature here gets more and more interesting that I plan to invest in a better camera to take photos and bring these birds into the home with framed pics! WE SEEN A MALE HOODED MERGANSER HERE IN BATTLE CREEK, MI. THURS. 23 RD OF APRIL IN POND & IT WAS SO BEAUTIFUL. WE HAD NEVER SEEN ONE SO HAD TO LOOK IT UP IN OUR BIRD BOOK. WE ONLY SEEN THE MALE SO WAS THE FEMALE ON THE NEST? THERE IS A INLAND IN THE MIDDLE OF THIS POND. WHERE WAS HE FROM?